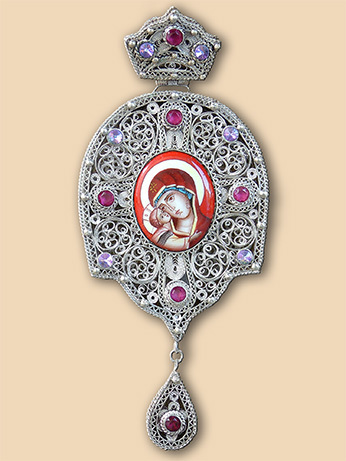 Bishop's panagia in silver filigree with hand painted Mother of God in enamel with red corundum stones and Swarovski crystals. Part of a set which includes pectoral cross NK017 and bishop's staff ZL003. Material: silver 950, red corundum stones, Swarovski crystals, enamel. Technique: filigree, granulation, stone setting, hand miniature painting on enamel. 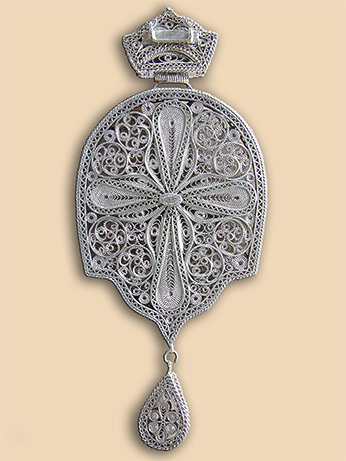 Weight: panagia 110 grams., chain 63 grams. Commissioned by: Father Milomir Vlaskovic, Priluzje - Kosovo and Metohia. In possession of : His Grace Artemios (Radosavljevic), Bishop of Ras-Prizren and Kosovo-Metohia.